This set contains most Tricky/complex MS SQL Server queries interview questions for experienced developers. If you think you are expert in sql, then go through this set and check that you are right or not. This set contains most puzzled/complex interview queries so that this set is for experienced developers, even DBA can also try this set to check their join concept, so if you have more then 5 years of exp. then this is for you. Try it, .PDF will be available soon. --103: You have a table(FuelDetail) with ID, Fuel, And Date columns. --Fuel column is contain fuel quantity at a particular time when car start traveling. So we need to find out that when the driver fill Petrol in his/her car. 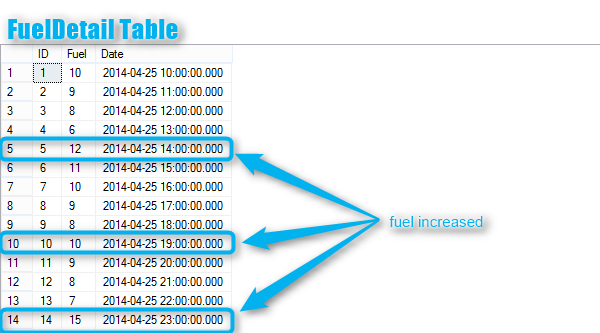 --By FuelDetail Table image on the top of this post, you can understand the query. Well, explain MECHANISM by which query answer for Q) 103 executes to produces desired result for us as it really seems solved using very very complex JOINS. For those who want to copy query..
Query for the Fuel output. I was able to generate output as expected. Last query we can rewrite as below.